I recently took and passed the Certified Business Analysis Professional (CBAP®) certification test offered by the International Institute of Business Analysts (IIBA®). Since my employer, CodeSmart, paid I was doubly anxious to pass on the first attempt. Yay! I did. A couple of things helped give me an advantage. The first was a lot of experience in business analysis. Not just the title of Business Analyst, but the activities I did within this role were in alignment with the Business Analysis Body of Knowledge (BABOK®). While the specific terms or context of knowledge areas and processes were new, they concepts themselves were very familiar. The second advantage was previously achieving certification as a Project Management Professional (PMP). Many of the tools and terms crossovers the professions including estimation, work breakdown structure, and the underlying competencies required. CodeSmart also paid for me to take online training through ESI. I received a 20% discount for having visited their booth at the PMI North American Global Congress in October. The eTraining was available for 42 days from registration. It provided some introduction to the course, to the BABOK, and pre-assessment test and then units by knowledge area. It concluded with test tips, drills, two more practice exams, and a course evaluation. I felt the course gave good exposure to what to expect on the test and some guidance on study but was rather high level. It was by no means a waste of time, but I couldn’t solely rely on the course and be sure of passing. As test day got closer I began to read the BABOK® through. I didn’t do anything too special at this time. I had previous experience with a large number of the tools and techniques covered. But the more technical diagrams I felt I could use some review on. I spent one evening reading the BABOK and searching online for examples to study until I was sure I understood each better. I am glad I did this. It helped me get at least a few questions correct on the test. I knew I wanted to commit the map of knowledge areas and processes to memory. I am a visual and kinetic learning, so simply reading the BABOK or practicing the drills of the course were not going to be much help. 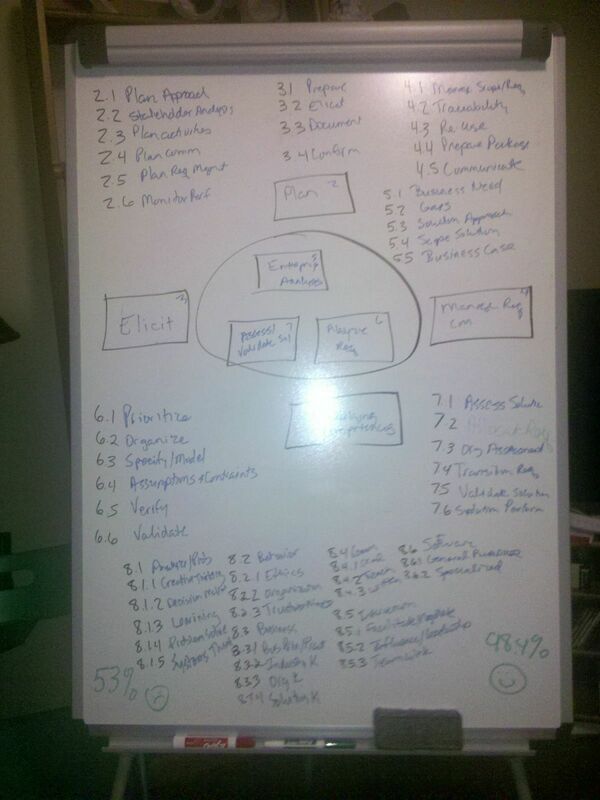 In the end (the day prior to the exam) I used a big pedestalled white board in my living room. The idea was to map the knowledge areas with processes plus underlying competencies. I took one pass without additional study or reference and got 53% percent of the mapping correct. I then drilled myself by drawing the mappings and practiced, waiting a couple of hours and tried the mapping again. This time I got 98%. I slept with the white board in my bedroom that night knowing that if I woke up panicked about the material, it would come in handy. In the morning I wiped the slate clean and tried the mapping again and again got 98%, getting a different section wrong then previously. I felt that I had retained enough to be comfortable taking the test. In the end, having this down pat didn’t provide that many additional correct answers. • Commit to memory knowledge areas and processes including underlying competencies. The test itself was an online computerized test proctored at a local community college. The test is 150 questions and they allow three and a half hours. You have the ability to flag questions either answered or unanswered. The test navigation allows you to move from previous or next question or previous or next flagged questions. In taking the test I went through each question and answered if I was relatively sure of the answer, flagging those that I skipped, or wasn’t sure enough. Once I got to the end I took a break and then went back to review the flagged questions. I did feel more confident the second time looking at the flagged questions. I struggled with the decision to review the questions a final time or to submit the test. I had plenty of time either way. In the end I submitted the test reasoning that the number of questions I would change on a review would not make an impact on my overall score unless I was one or two away from passing and any changes I made were in my favor rather than against it. I hit submit, was presented with a survey regarding the test experience, and the second I submitted the survey received a “congratulations on passing” message. I don’t yet know my actual score, but I know the important thing. I would recommend doing some research or asking around before picking a study service. Price, hours to complete, and depth of material will vary. You want to make sure any service you buy, if any, meets your style of study. Some people may be comfortable without purchasing a study service at all. I would have been disappointed if I had paid the full amount for the ESI program myself. The 20% discount helped. Good luck in your own search for certification. I hope this blog has helped, and please let me know if you have any questions. Also see this PRESENTATION I gave to CBAP/CCBA Study Group members from the Seattle IIBA Chapter in January 2012.